Before Doctor Beeching wielded his railway axe, the line south from his home town had already closed. The connection from East Grinstead down to Lewes hadn't been well used, with most of the intermediate stations far from the villages after which they were named. But locals weren't best pleased, and a few of them started up the Bluebell Railway Preservation Society to keep the route alive. 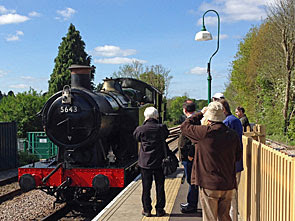 The first (non-steam) services ran from Sheffield Park in 1960, extended to Horsted Keynes in 1962 and Kingscote in 1994. It was only last Easter that the line was finally restored to East Grinstead, after much fundraising and a lot of hard work driving fresh tracks through the Imberhorne Cutting. But now there's a link to a British Rail station, so anyone can come visiting without the need to drive to the Sussex countryside or catch an infrequent bus. Which meant I could finally cross off the Bluebell Railway from my list of Things I Can't Believe I Haven't Done Yet. And I've added it to my list of Things I Think I Should Do Again. East Grinstead: The newest station on the line is the least impressive, little more than a raised platform alongside the terminus of trains from London. The normal East Grinstead station is pretty dull too, recently replaced by an off-the-shelf bland construction with space for ticket barriers and a coffee/supplies dispensing unit. Don't let that put you off visiting the town itself, which is rather nice (here's my list of ten things to do in East Grinstead, should you ever be interested). But you'll probably be more interested in paying your £16.50 and nipping onto a train. It's quite a steep fare, admittedly, but it does cover unlimited rides for a day and all the things to see at the other stations, plus you can get the ticket for £14 online so long as you book at least eight days in advance. East Grinstead → Kingscote: The first bit of major infrastructure on the way out of town is the Imberhorne viaduct, crossing high over a trickling river below. What's not immediately obvious, unless you know the story, is why the banks of the subsequent cutting are pinned back behind plastic sheeting. The Imberhorne Cutting was used as landfill after the line closed, which made huge economic sense at the time, but proved a nightmare when volunteers were trying to reopen the line. A heck of a lot of digging was required, and the spoil was transported to Ardingly to build an embankment to support the next planned reopening. Watch out for the plaque which marks the point where the final join was made. And rest assured, the line gets much prettier after the cutting. Kingscote: Up until last Easter this was the northern terminus of the line, hence important. It's nowhere near as important now, not least because it's car-park-less, and because all that's nearby are farms and woodland. The station's been restored in 1950s style, and is most attractive, but whether you'd find enough to do in the hour and a quarter before the next train came, I rather doubt. Kingscote → Horsted Keynes: This is a long run through rolling countryside, indeed there's barely a residential interlude anywhere along the line. One of these comes at Sharpthorne, the only settlement of any significant size, which the Bluebell Railway ignores by burrowing underneath. The Sharpthorne Tunnel is the longest on any preserved railway in the UK at 780 yards long, although it feels longer chugging through in confinement. The rest of this stretch is farmland and forest, and lots of it. Plus at this time of year there are indeed bluebells along the Bluebell Railway, scattered along the banks along much of the line. There are so many that you suspect someone's been spending spent some of the railway's income on propagation, but not so many anywhere that you'd ever describe them as a blue carpet. Horsted Keynes: This is a marvellous station, boasting as many as five platforms, and decked out to evoke a 1920s ambience. 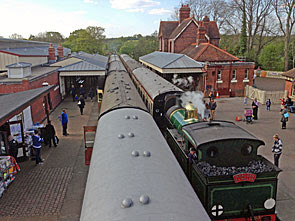 You may well have seen Horsted Keynes on film and TV, most recently as Downton station in Downton Abbey, but also in the classic The Railway Children. It's a very good place to pause and get off, and for longer than the usual thirteen minute stopover allows. On platform 1 there's a second hand transport bookshop in a railway carriage, stocked in some depth, and utterly worth a browse if you like that sort of thing. Cross via the subway to platforms 3 and 4 where there's an old WH Smith bookstall, still functional, and a small refreshment room that serves tea, biscuits and ale. And over on platform 5 is the shed where the railway's not inconsiderable number of carriages are restored and repaired, while you watch. Throw in a selection of age-appropriate metalled adverts, a cinema room and all the palaver of steam train stopovers, and you might even stop off here on your way back too. Horsted Keynes → Sheffield Park: To the south of the station, past the listed signal box, the tracks divide. One branch runs cross country to Haywards Heath, and that's the next (very long term) target for restoration. The mainline runs south through a rolling rural landscape that's no Settle/Carlisle, but still more attractive than many other preserved railways manage. By now we're three quarters of an hour from East Grinstead, which you may have spent in an ageing slamdoor British Rail carriage, or perhaps in a restored carriage of Metropolitan railway vintage (as seen in steam on the Underground last year). And watch out, just before your final destination, for a sign beside the tracks marking the crossing of the Greenwich Meridian a few yards outside Sheffield Park station. Sheffield Park: The last station on the line has been given a Victorian makeover, although a few more modern brick buildings don't quite match heritage targets. A footbridge crossing the tracks provides a proper panorama of all that's going on, which often involves locomotives stocking up with coal and water for the next trip north. 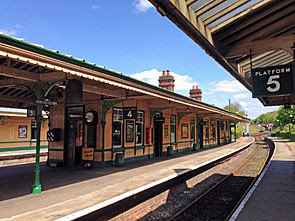 On platform 1 is a relatively large museum devoted to the railway and to other Southern affairs, but the majority of attractions are on the ticket office side on platform 2. Inside the engine shed are some of the large collection of locos that've been restored here, while the pub/restaurant serves proper meals, and also the tastiest chunkiest slice of sponge I've had with a cup of tea in years. Exit is via the gift shop, which is well stocked for visitors of all ages. And if you want to head onwards to Lewes these days you'll need an infrequent bus, from the Southdown stand adjacent to the car park. Sheffield Park: And then there's Sheffield Park, the country estate across the fields, easily accessible on foot in about fifteen minutes. The gothic mansion is still in private ownership, but the National Trust own the 80 acre gardens, and they're magnificent. Capability Brown did the original landscaping, arranging dense woodland around a selection of ponds and lakes joined by weirs. Come in autumn and the show of tints is supposedly stunning, although spring's impressive enough with the rhododendrons in flower and copious blossom on many of the trees. Admission's nine pounds, although this summer there's a cut-price offer for Bluebell Railway riders, should you be seeking better value. Keen gardeners will find much to inspire them within the gardens, while the rest of us can simply stroll and admire until it's time to wander back and take the steam train home.